Blogging To, From, and About SFFF 2008: Graphic Novelists, the Pander Brothers, new feature SEFLESS - Thurs & Sat! Graphic Novelists, the Pander Brothers, new feature SEFLESS - Thurs & Sat! 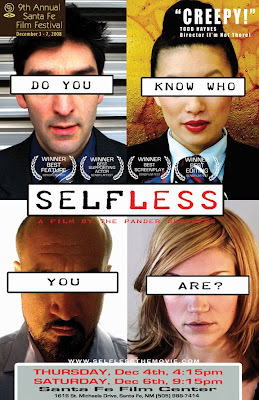 SELFLESS, the debut feature by the Pander Brothers is an existential thriller about a self-absorbed architect whose world collapses when his identity is stolen. Recently awarded Best Feature, Best Screenplay, Best Supporting Actor (Mo Gallini), and Best Editing at the BendFilm Festival, SELFLESS stars Joshua Rengert, Mo Gallini (2 Fast 2 Furious, Mr. & Mrs. Smith, End of Days, Mulholland Drive), October Moore, and Jen Hong. Dylan Gray, a rising young star in the trendy 'green' architecture movement, is flying high from winning a prized high-rise commission when he unwittingly plants the seeds of his own destruction during a chance encounter with a deadly stranger. While waiting to board his plane home to Portland, Dylan sketches an unflattering caricature of fellow passenger Wesley Stone to impress an attractive flight attendant. As Dylan soon learns, the stranger he brazenly ridiculed is a master at stealing identities. And he's just made Dylan Gray his next target! will be in attendance and have a Q& A at the SELFLESS screenings. SELFLESS - Trailer - DO YOU KNOW WHO YOU ARE?